This code aims to complement the GTCE’s general code for teachers. When that code was being drawn up, there was some concern about the implications of ‘demonstrating respect for diversity and promoting equality’ and whether that principle might ever come into conflict with a teacher’s sense of integrity in relation to his or her own beliefs. This proposed code for teachers of RE is designed to help reassure teachers of RE themselves as well as pupils, parents and colleagues that a professional approach to such issues can and will be observed. This document has been drawn up by an RE Council working group with representation from NATRE, AREIAC, NASACRE and several religious/non religious belief traditions. It has been sent out for consultation through AREIAC, NATRE and the REC and account has been taken of the responses received. 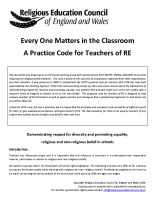 Unlike the GTCE code, this one is voluntary but it is hoped that the principles and examples it sets out will be of sufficient worth for them to gain widespread acceptance amongst teachers of RE. The ideal would be for them to be used by teachers of any subject who address issues of religion and belief in their own area.